The Napoleon Banff 1400C Wood Stove features Napoleon’s advanced wood burning technology that provides you with the cleanest, most efficient heating experience. 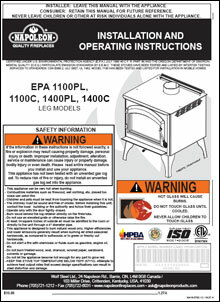 This stove has an impressive 70,000 BTU’s and can efficiently heat up to 2,000 square feet. The solid cast iron design is reminiscent of a European style and has a single decorative arched door with ceramic glass that presents a large view of the fire. It also has an elegant and convenient lift top lid that exposes the hotter surface of the stove’s heavy gauge steel top – ideal for quick cooking!